Alcohol is only allowed at Hopkins Shelter and Lions Shelter with the purchase of a permit from the DeKalb Park District. Shelters are not heated or air-conditioned and can only be rented from April 1-October 31st every calendar year. $100 Cash Deposit REQUIRED when keys are picked up. DeKalb Park District shelters are available for rent by individuals and groups from April 1st through October 31st each year. Rentals are made on a first-come basis. For the 2019 season, rentals can be made starting January 2nd. Hopkins, Lions and Welsh Shelters can be booked up to one year in advance. (ex: May 7th, 2020 can be booked on May 7th, 2019). Katz and McCormick Shelters can be booked starting the first business day in March. Rentals must be booked no less than one week in advance to the event date. You may call the Administration Office (815.758.6663) to check availability. Full payment is required to secure your reservation. Payment accepted includes cash, check, and Visa or MasterCard. Payments must be made in person or over the phone, depending on which method you are using to reserve. Renters may pickup a key for their rental date Wednesday through Friday the week of your event between 8:30am and 5pm. You may not enter the facility until 8am the day of your rental unless prior arrangements have been made with the Park District. A CASH security deposit of $100 is required at the time you pick up the key. This deposit is returned to you when you return the key as long as the shelter house and area, inside and outside, is returned to equal or better condition than it was found. If the shelter is found otherwise, the Park District reserves the right to retain all or part of the deposit. Damages in excess of the $100 deposit will be billed to the renter. Built in 1935, the Hopkins Shelter has been a fixture in the park for generations. The shelter was renovated in 2008 to include new bathrooms, a new roof, new windows, new kitchen area and family restrooms. 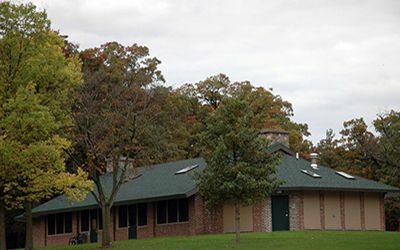 Located in the center of Hopkins Park, the Hopkins Shelter is great for reunions and large family picnics. It is in close proximity to the playground and swimming pool. Basic rentals includes the shelter house, attached bathrooms and a designated area adjacent to the shelter. Also included are designated grills and picnic tables. Large group rentals includes the shelter house, attached bathrooms, and a designated area adjacent to the shelter to accommodate a larger group. Also included are designated grills and picnic tables. Non-prime rental rates are reduced fees for rentals Monday-Friday. Non-prime dates may also be rented for shorter durations. Special Events (Hopkins Park Only) Non-profit 501c3 fundraisers and events exceeding 150 people are required to submit a Special Event Application. Additional information may be required during the approval process. Prices for these events are individually quoted based on impacts, costs, and involvement of the Park District. Failure to provide necessary information may result in the cancellation of an event. Due to the impact on the Hopkins Park and the shelter, the number of these types of events are limited to eight (8) per year. Located on West Taylor St., Lions Shelter offers a private setting for picnics and gatherings. There is plenty of open space and a playground in the front of the park. Address: 700 W. Taylor St. Located on Russell Road, Welsh Shelter is an open air shelter with a playground, basketball courts, a ball field and plenty of open space nearby. In close proximity to NIU, Welsh shelter is great for small university gatherings and picnics. 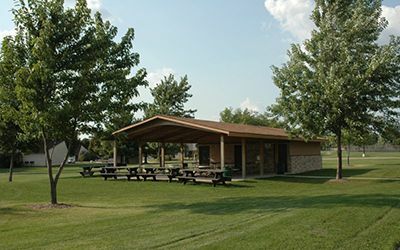 Located on Dresser Road, Katz Park Shelter is an open air shelter with a playground, ball fields, a dog park, skate park and plenty of open space nearby. Located on 7th Street, McCormick Shelter is an open air shelter with a playground, ball fields and plenty of open space nearby. Address: 1700 S. 7th St.